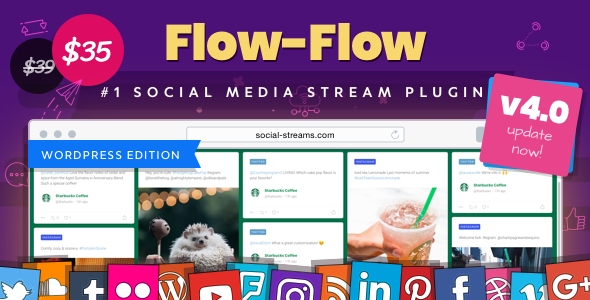 Flow-Flow WordPress Social Stream Plugin is premium social media plugin to display social feeds in beautiful responsive grid with filters and live search. Make any combinations of social feeds with Flow-Flow. For example, you can have 5 Facebook pages, 5 Twitter hashtags and 5 Instagram users in one stream. I can not use, request purchase code and email can someone help? Lease update on Version 4.4.4 March 22, 2019 Thank you!!! First of all, it doesn't work. Second, it makes you reset your facebook password for phising reasons. Please remove (and don't ever upload, none of the rescents uploads of this plugin ever worked. I have Lost My two FB Accounts!!!!!!!!! First of all, it doesn't work. Second, it makes you reset your facebook password for phising reasons. Please remove (and don't ever upload, none of the rescents uploads of this plugin ever worked). I have Lost My two Accounts. these themes are nulled or not?